PRP known as Platelet-Rich Plasma is human blood that is spun down and separated. It produces a concentration of platelets above normal values. Platelets are the clotting cells of our blood, but they also have great potential in enhancing healing of muscle, tendon, and ligament. Growth factors released by platelets recruit reparative cells augment tissue repair, and accelerate soft tissue healing. This therapy is a proactive therapeutic option for male and female patients experiencing hair loss. It is an exciting non-surgical option for patients who require stimulation of hair growth for hair loss conditions such as balding. The PRP serum contains a concentration of growth factors, mesenchymal stem cell, cytokines, and other elements. 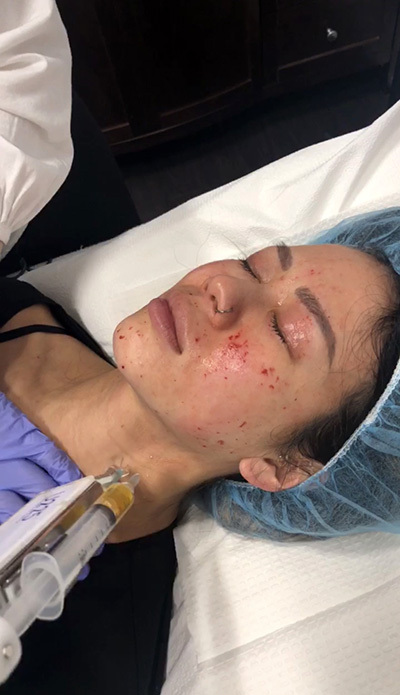 We are excited to have an expert medical esthetician for PRP, Amira Gindi, provide this treatment at ALSC. She also excels in PRP facial rejuvenation, also called Vampire Facials and Dracula Therapy. This Facial treatments are relied on to rejuvenate their skin and erase signs of aging like lines, wrinkles, creases, and folds of skin. PRP therapy is wonderful for restoring the layer of collagen and elastin under the skin so that it is more effective in supporting suppleness. Our medical estheticians may choose to administer the PRP injection into the lines and problem areas. Alternatively, they may combine the treatment with microneedling. By using a micropen, they create minute pores and massage the serum into the skin so that it regains its youthful glow. Hair loss: Doctors may inject PRP into the scalp to promote hair growth and prevent hair loss. These injections are effective in treating androgenic alopecia also known as male pattern baldness. Tendon injuries: Doctors may use PRP injections to treat chronic tendon problems, such as tennis elbow, Achilles tendonitis at the ankle, and jumper’s knee, or pain in the patellar tendon in the knee. Acute injuries: Doctors may use PRP injections to treat acute sports injuries like pulled hamstring muscles or knee sprains. Postsurgical repair: Ddoctors may use PRP injections after surgery to repair a torn tendon or ligaments. Osteoarthritis: Doctors may inject PRP into the knees of people with osteoarthritis.